Get a first sneak peak at Windows 10’s Continuum feature | ComTek Computer Services Inc.
Microsoft revealed information about a new Windows 10 feature called Continuum back in September 2014. One of the usage scenarios that Microsoft needs to handle are when a hybrid device is being used. These devices, like Microsoft's own Surface or The Lenovo Yoga for instance, can be used as a tablet with touch but also with a keyboard that can be connected to the device easily. Contiuum is an attempt to deliver the right experience regardless of a system's state. The feature did not ship with the initial Windows 10 build that Microsoft released shortly after the presentation but has been implemented partially in the most recent build that became available on Tuesday. Here is the initial demonstration of Continuum by Microsoft. What has been integrated into the most recent Windows 10 build is not nearly complete yet. It requires that you create a new Registry key and it may cause all kinds of side-effects as well. For now, it is not really suggested to enable the feature unless you want a sneak peak of things to come. Make sure you have the most recent update installed. This is Windows 10 Technical Preview build 9879 right now. You may need to switch the update delivery from slow to fast before it is picked up by Windows Update. 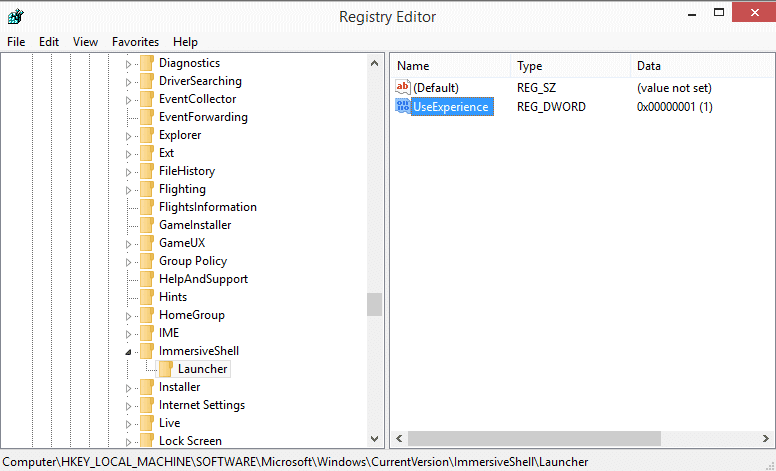 Open the Windows Registry Editor with a tap on the Windows key, typing regedit and hitting enter. Right-click on Launcher and select New > Dword (32-bit) Value and name it UseExperience. Double-click on the newly created Dword and change its value to 1. Log off and on again, restart the PC or kill the explorer process and restart it for the changes to take effect. So how does it look like after you have completed the operation? 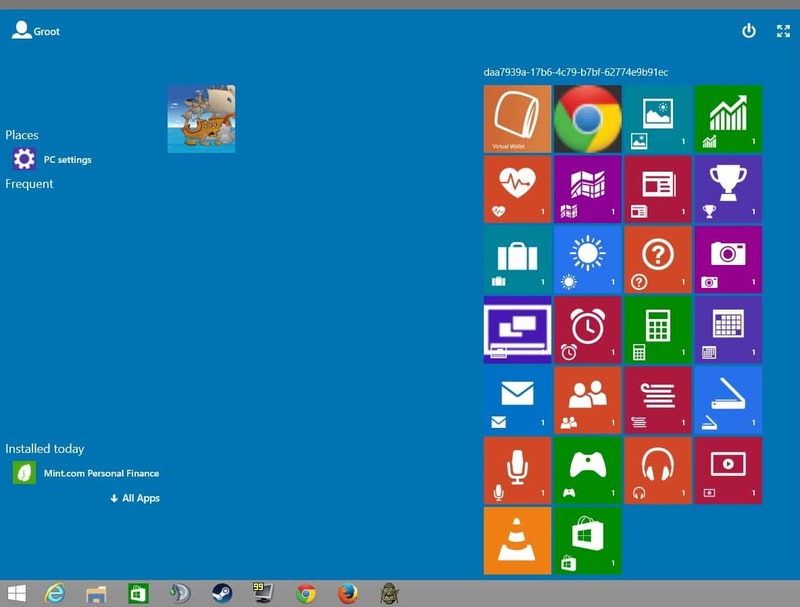 Here is a screenshot of the start menu on a desktop PC. The Start Menu is barely functional at this point in time. There is no search integrated for example which means you either have to use Windows-F to bring up the search or keep the Search icon in the taskbar so that you can make use of it instead. It is unclear if the prompts to switch to a different mode are already implemented or not. This won't work on a desktop PC for obvious reasons. Since this is not really functional at the time of writing, you may want to disable it again to use the old start menu or the start screen interface instead. To do so simply set the UseExperience key to 0 or delete the key entirely. You do need to restart or perform one of the other operations listed above before the change takes effect. Another thing that is unclear is if this will land on the desktop as well in one form or another or if the regular start menu that is part of the preview builds will remain in its current form.